On a bright Spring morning, the last Sunday in October, the CapeRay staff, students and their families joined the iThemba Walk Against Breast Cancer. There were 22 who participated in the 5 km walk (excluding two family dogs! ), setting out from Green Point in the shadow of the new Cape Town stadium. The theme for the family fun event, “Think pink and put your best foot forward”, was taken to heart by the CapeRay team. 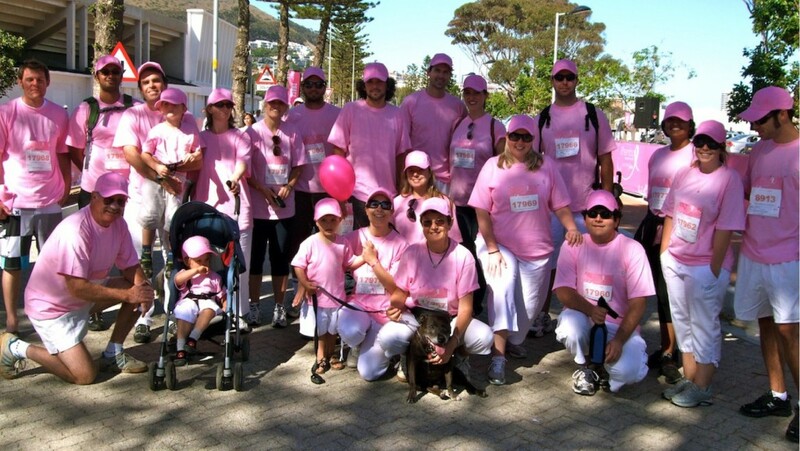 Dressed in pink tee-shirts and golf caps, with the companyʼs silver logo emblazoned on both, the participants enjoyed a friendly walk along the Sea Point esplanade, with spectacular views across the bay to Robben Island. Almost ten thousand people contributed to a worthy cause: the raising of funds for breast cancer education and awareness in South Africa. iThemba is the Zulu word for “hope” and through its participation in the walkathon, CapeRay has made its contribution to the realisation that early detection saves lives.